This pamphlet is intended for any American Jewish college student who is confused about the anti-Israel Boycott, Divestiture and Sanctions (BDS) movement and conflicted about what it means to be loyal to human rights values while also remaining loyal to Judaism and the Jewish people. It is also an important resource for their parents and grandparents who are worried about their young adult children’s Jewish identity and bond with the state of Israel as they are confronted with anti-Israel demonstrations on college and university campuses across the United States. This booklet offers a way for American liberal Jews who love and support the state of Israel to continue to do so despite their discomfort with specific Israeli policies, the Israeli political right’s control of the Israeli government, and American Jewish alienation from segments of the organized American Jewish community that considers progressive Zionist values and positions to be anathema to the pro-Israel camp. Finally, this pamphlet is for American conservative and right-wing Zionists who believe that American liberal Jews have been duped by the left about Israel and consequently have become, in the view of the conservative right, part of the anti-Israel camp. “The Third Narrative: Progressive Answers to the Far Left’s Critiques of Israel,” will, regardless of your positions, values, worries, and fears, offer you an opportunity to consider a different pro-Zionist position. The pamphlet addresses most of the accusations leveled against Israel by the international BDS movement, by the international media and on the web, on college and university campuses, and in other settings. • Is one, bi-national state a solution to the Israel-Palestinian conflict? • Is pro-Israel and progressive an oxymoron? • Should boycotts, divestment and sanctions (BDS) against Israel be encouraged? • Does Zionism = racism? • Is “ethnic cleansing” inherent to Zionism? • Does the pro-Israel lobby have a stranglehold on the U.S. government? It is important that all of us be able to respond to these questions not just from the perspective of the Israeli and American Jewish political right, but of the Jewish progressive left as well. I highly recommend this important contribution to the discussion about Israel and that you share it with your high school and college-age children, grandchildren, and friends (Jewish and non-Jewish) alike. 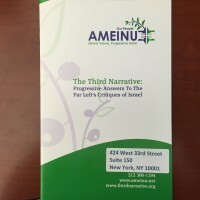 You can learn more about the Third Narrative at https://thirdnarrative.org/ and acquire a copy by calling Ameinu at (212) 366 1194 or visiting its website at http://www.ameinu.net. Rabbi John L. Rosove is Senior Rabbi of Temple Israel of Hollywood. He received Rabbinic Ordination from HUC-JIR, NY, and a Doctor of Divinity from HUC-JIR, LA. He is a passionate progressive Reform Zionist, is on the advisory committee of the Daniel Center of Tel Aviv, a member of the Rabbinic Cabinet of J Street and regards social justice work and high ethical practices as essential core Jewish religious values.